At the time, I thought I merely got the answer I deserved for asking such a trite question. But then twenty-five years happened, and throughout that time, I hung in there. In the beginning I hung in there because I wanted to, but now I hang in there because I have to: there’s no turning back at this point. The die has been cast. “Hanging in there” is a simple objective, but it requires nerve, energy, and a variety of personal resources. Hanging in there was never easy and it still isn’t, especially if you’re a creative type who has run his own studio for fifteen years, and you never want a day job ever again (which is good, because regular employment is probably out of the question at this point). Living on your wits is never easy, otherwise everyone would do it—but the satisfaction you derive from making the most of your talents and abilities is as good as adult life gets. Awards and accolades are nice, but the big payoff is the unfettered, fulfilling life you get to live between such high points. The esteem of people you respect and admire is the other big payoff: Milton Glaser is probably the most revered graphic artist alive. 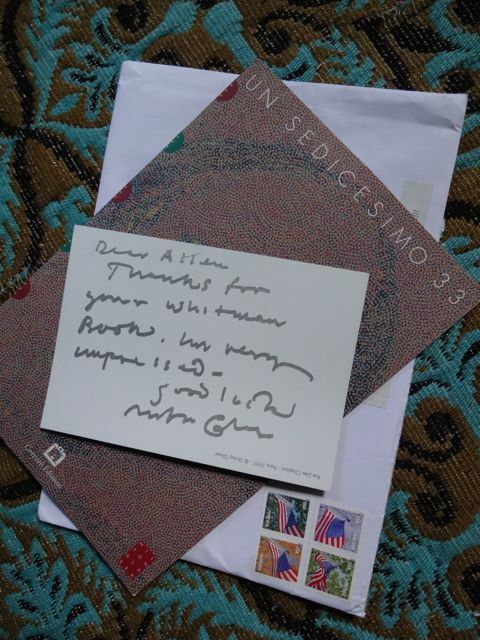 Someone like me receiving a letter of praise from Milton Glaser is like a local bar band receiving a fan letter from Bob Dylan. I’m deeply touched and honored that he would take the trouble to send a kind note like this. To say it means a lot is a gross understatement: after twenty-five years of working as a graphic artist, it’s deeply gratifying to get a nod from one of your heroes. Thanks, Milton. 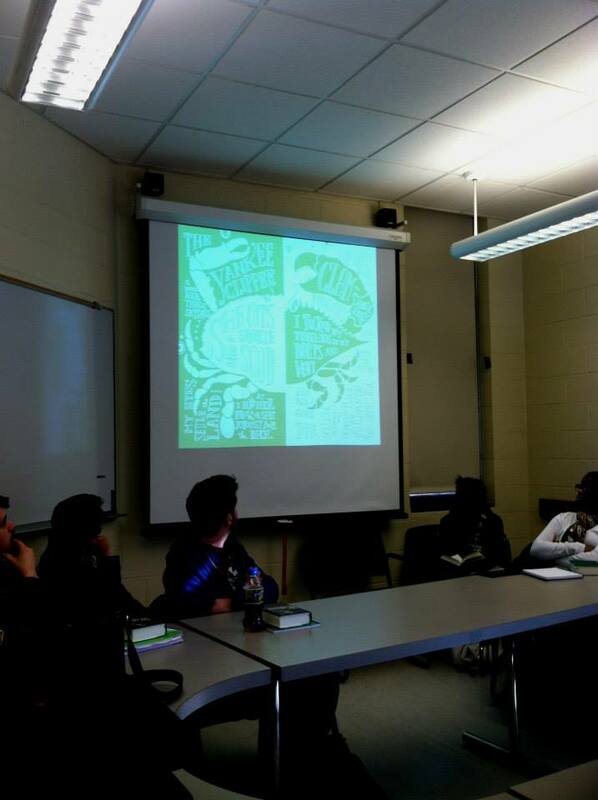 This entry was posted in Whitman Illuminated on March 16, 2014 by Allen Crawford. 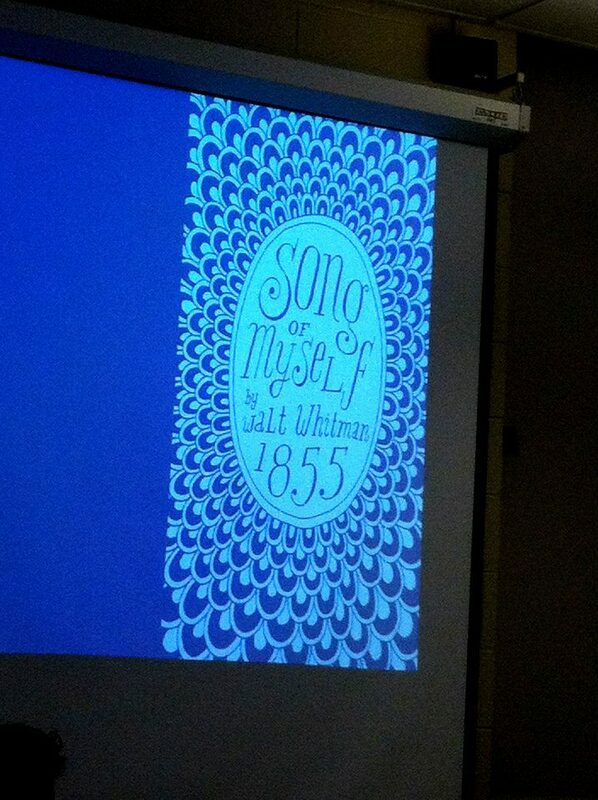 The second animated gif made from the art in Whitman Illuminated: Song of Myself, by Tin House. This entry was posted in Whitman Illuminated on March 8, 2014 by Allen Crawford. The talented filmmaker David Kessler has generously offered to create the trailer for my book. 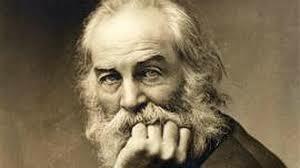 It just so happens that my other friend Bill is a dead ringer for Whitman, and has agreed to make a cameo in the trailer. Excited to see what David does with the footage he’s currently shooting. Stay tuned. This entry was posted in Whitman Illuminated on March 7, 2014 by Allen Crawford. This entry was posted in Whitman Illuminated on March 6, 2014 by Allen Crawford. 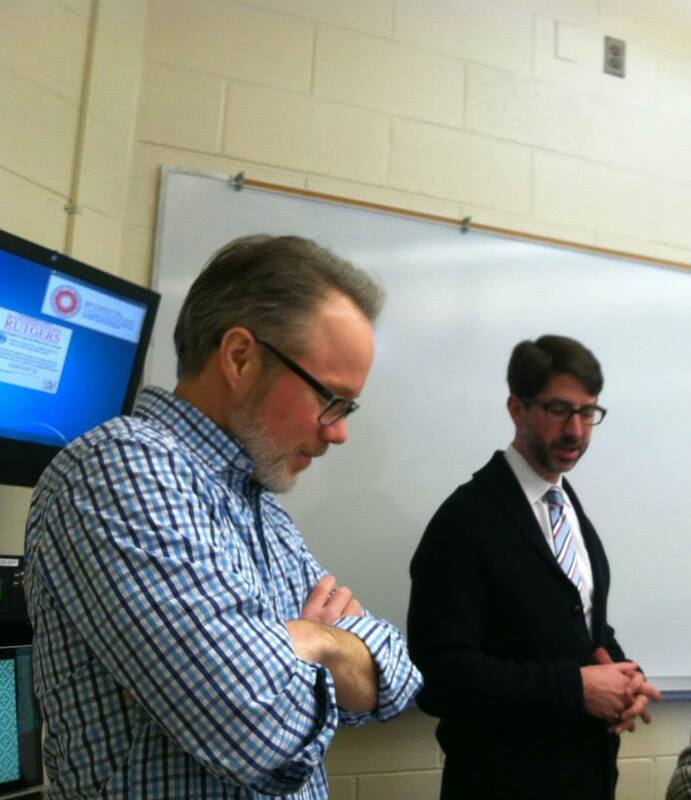 My sincere thanks to Prof. Tyler Hoffman at Rutgers University-Camden for inviting me to speak to his Whitman class today. It was my first Whitman-related event. Very enjoyable. 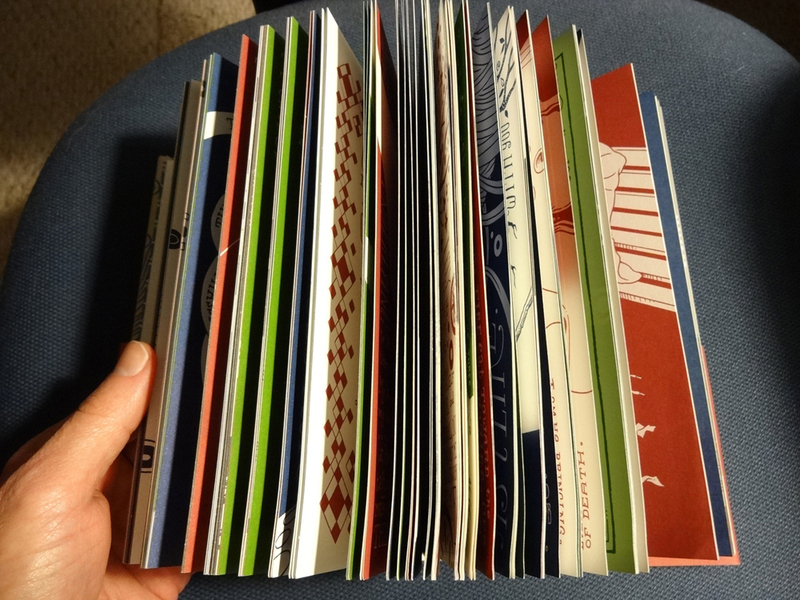 I received a special thrill when I was given the chance to ogle the Nick Virgilio Archive. So much of his wonderful haiku work has yet to be read. I suspect his posthumous stature will rise in the coming decades. The Writing University Open Courses website provides MOOCs (Massive Open Online Courses) for creative writing through the International Writing Program at the University of Iowa, which will offer new opportunities for the study and practice of creative writing and literary analysis to an unlimited number of participants around the world. 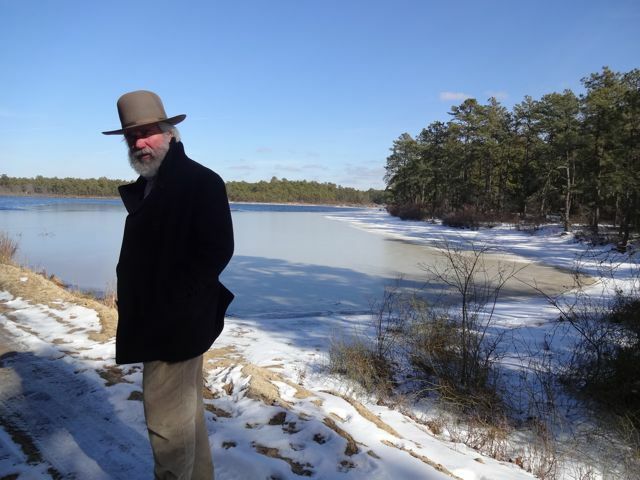 The first MOOC, Every Atom: Walt Whitman’s Song of Myself, offers participants the opportunity to read, consider, and discuss the epic poem over a six-week course. Roy J. Carver Professor of English Ed Folsom and International Writing Program Director Christopher Merrill will lead the examination of Song of Myself through video lectures, live breakout sessions, and ongoing online discussion. Hosted by the University of Iowa’s Virtual Writing University, Every Atom will open in mid-February 2014. Even after living with this poem for over a year, I am still gaining some very helpful insights through this course. Go here to sign up. This entry was posted in Whitman Illuminated on March 4, 2014 by Allen Crawford.